Edible parts: Whole plant, bulb, leaves and flowers. Vitamin C keeps teeth and bones healthy. Legend says that the ancient greats of Atlantis used the dandelion as a food and a medicine. They introduced the plant to America. They used all parts of the plant, even the roots which they ground into a coffee like drink. The name dandelion comes from the the french dent-de-lion (lions teeth), referring to the jagged points on the leaves which look like sharp teeth. the young leaves being totally delicious. Avoid taking the leaves after the flowers have formed as the leaves will taste too bitter. 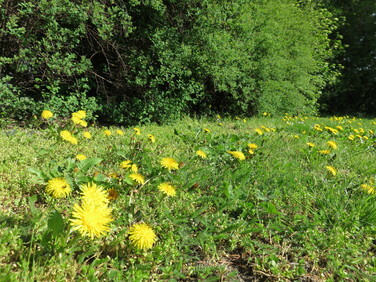 To cook dandelion leaves, wash them well with water and pour boiling water over them. let them boil for 5 minutes then season them with salt, pepper and olive oil. If the taste of dandelion leaves is too strong for anyone, include them in a curry or boil them with some cabbage to smooth out the taste. They are also delicious mixed with linden tree leaves, hawthorn leaves & rocket salad sprinkled with herbs olive oil and balsamic vinegar.